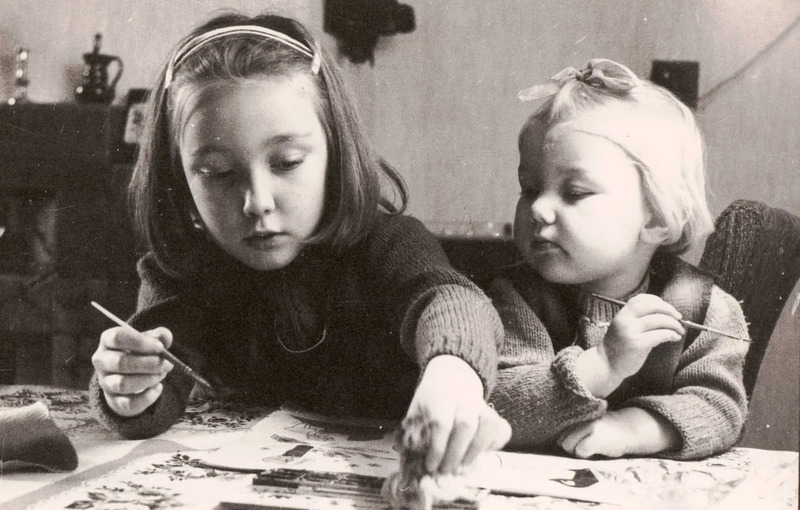 Anne shares a few of the 100s of photographs that she has inherited from her grandfather's collection and tells us why they are still very important to her. I live in Hurst Green in Halesowen now, but before then I was in Rowley. I have brought some pictures in from a large box of photographs taken by my granddad. So this first one is a picture of my Auntie Mary. She was my dad's sister, Mary Waters, and they came from Langley. 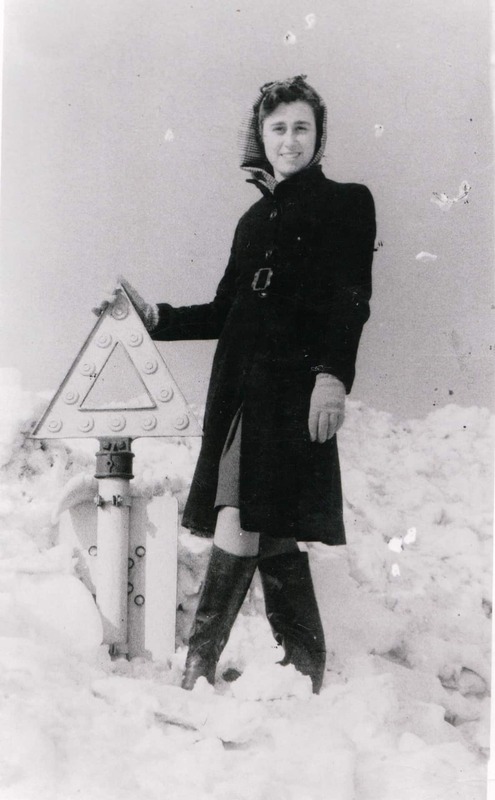 So this is Auntie Mary standing on a snowdrift with a road sign by side of her. So the snowdrift must be six foot deep. It was taken in 1947 and it was taken next to a signpost along the Wolverhampton Road. So she standing on a snowdrift with a hand with the sign that's only waist high. Mary Waters standing on a snow drift on the Birmingham New Road in 1947. Mary was born around 1920 and she's in her late 20s here. She died about three years ago. My Auntie Mary and also my uncle Len (that's my dad's brother and sister) never married so then lived together. When my uncle passed away my aunt Mary died within six weeks of him. She was really lovely, my Aunt Mary, well my uncle Len was a bit difficult (laughs) but Auntie Mary was fabulous. This photo was taken in the bad winter of 1947. She is standing on top of the snowdrift and the top of the road sign is waist high. This one is a smashing picture of my nan and her sister, my Great Auntie Kath. My nan's name was Olive Hinton and then when she got married became Olive Craddock. So this is Olive Craddock and Auntie Kath - Kath Ogden. Kath married a chap from South Wales and so she moved down to Barry to live with him. My nan Olive and Aunty Kath were extremely close so my mum's family travelled backwards and forwards to Barry all the time, as did we when I was older. When I was about ten or eleven I used to go down with nan and granddad and stay with Auntie Kath. 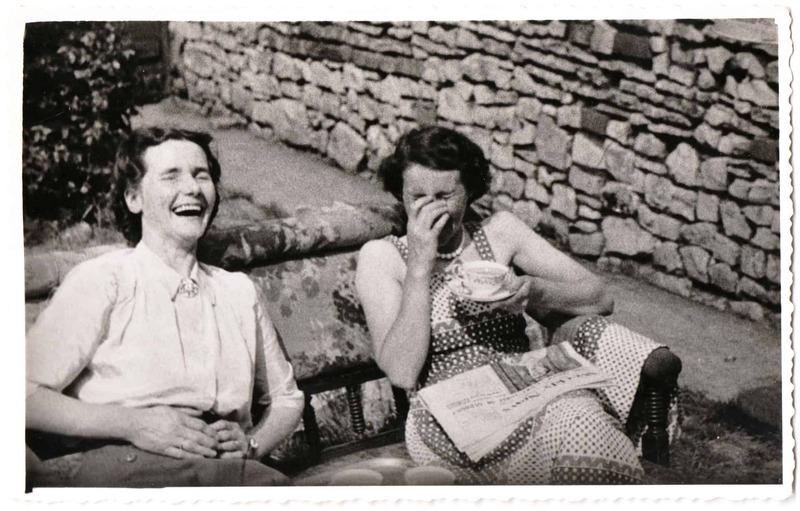 It's such a lovely picture because it's just as they are, there's two sisters they're having a really good laugh and joke. My nan is holding her stomach because she's laughing. Aunty Kath has got a cup and saucer and something has really tickled them. It's such a happy picture I think. It's taken in Auntie Kath's garden. She lived in a back-to-back in Barry. 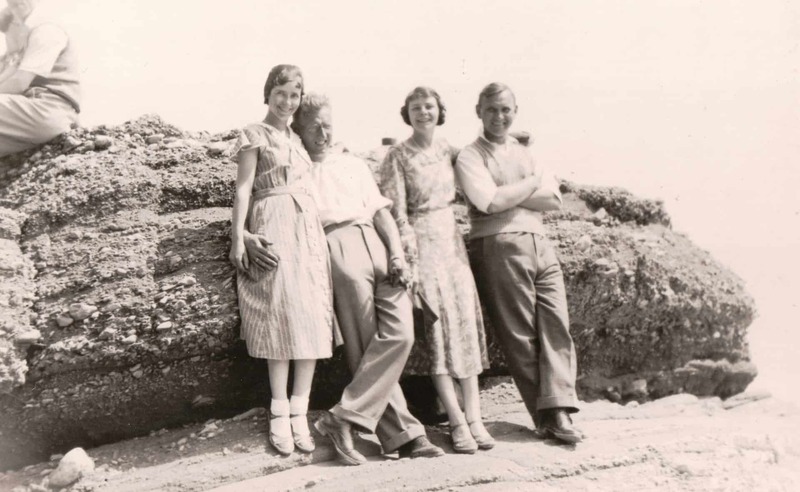 This is Olive and Harry Craddock on the left, my nan and grandad, and Auntie Beat and Uncle Tom on the right. It's such a lovely picture. I found it and I thought "that's my nan and grandad when they were young." They were great people. Grandad was a real character. 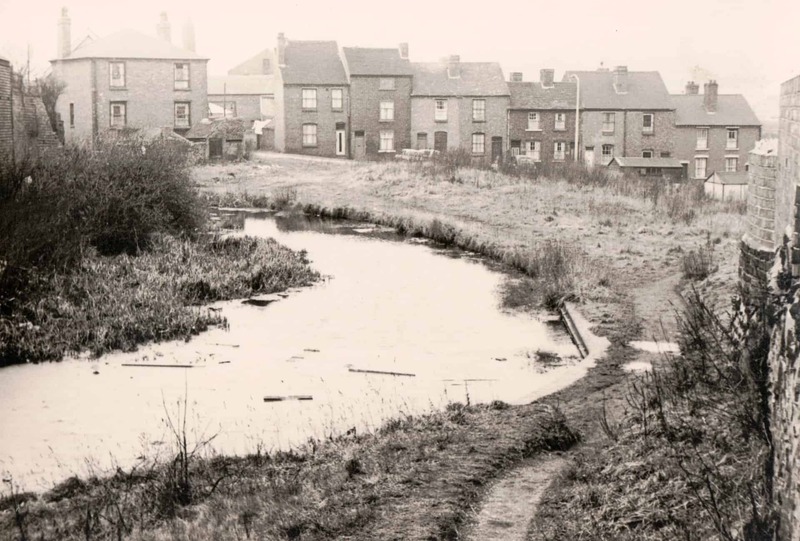 They were very Black Country and both came from very poor families. 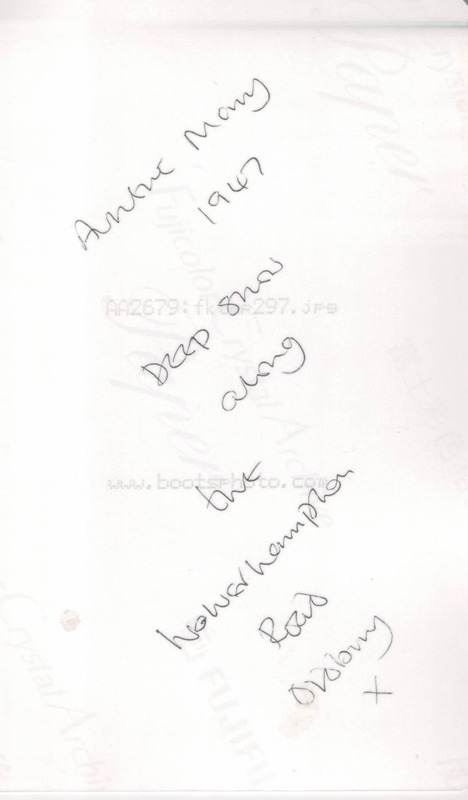 Grandad came from Tat Bank in Oldbury and my nan came from Rounds Green in Oldbury. They met at Accles and Pollock. Granddad worked in the accounts department and nan worked, well she did twelve-hour shifts at a machine. Twelve-hour shifts just standing there. Granddad used to come round with the wages, and that's how they met. She was a lovely woman my nan, and granddad was just hilarious. My dad was lovely but he liked things done in a certain way. But my granddad, well he was a complete rebel and so he used to come in and cause complete disruption which I thought was hilarious. We used to go down on Saturdays' and granddad always used to be watching grandstand or the wrestling or something like that. He used to get on nan's nerves all the time but they loved each other enormously. I've got a smashing picture of them looking at each other, probably in the 1950s. Nan was beautiful, very pretty. I've got a lovely picture of her when she was 18. A studio picture, a sepia picture. She was stunning. This is another holiday one, and this is my grandad again. This is South Wales, and it would be Barry again. I brought this one in because it's got my mum on. So my mum is there, that's Janice Craddock. I reckon she's about 12 in this photo so it must have been taken in about 1948 as she was born in 1934. 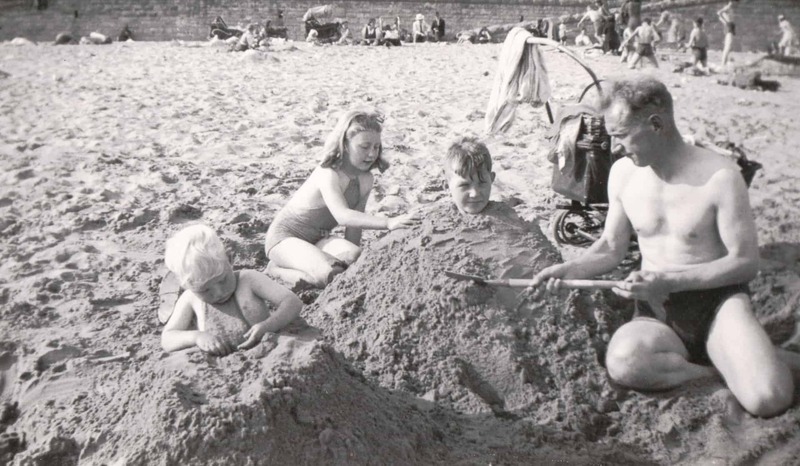 And then the two that are being buried in sand, the one in between my mom and my granddad, is Gareth and the little one with blonde hair is Colin. They were Auntie Kath's sons. They were all very close to each other. This is me and my little sister and Wendy. Grandad has taken it and the back he has put 'lessons in art'. Because we're both quite arty. I'm on the left and my sister Wendy is on the right. My sister's face is a gem, that's why I chose this. This was taken at nan's house in Mallin Street in West Smethwick, not far from where Chances Glass Factory used to be. And we're dressed more or less the same, I think nanOlive Craddock used to make us our clothes. If I remember rightly these jumpers were either red or green. This is about 1969, and I reckon I'm about ten and my sisters only little. I think I am telling her what to do here and she's taking absolutely no notice. We are very close, we used to go on each other's nerves when we when I was about 15 and she was about ten. But we are enormously close I don't know what I would do without her now. Bromford Lane Bridge, West Bromwich Street. Date unkown. Grandad (Harry Craddock) used to go around just taking photographs of places. 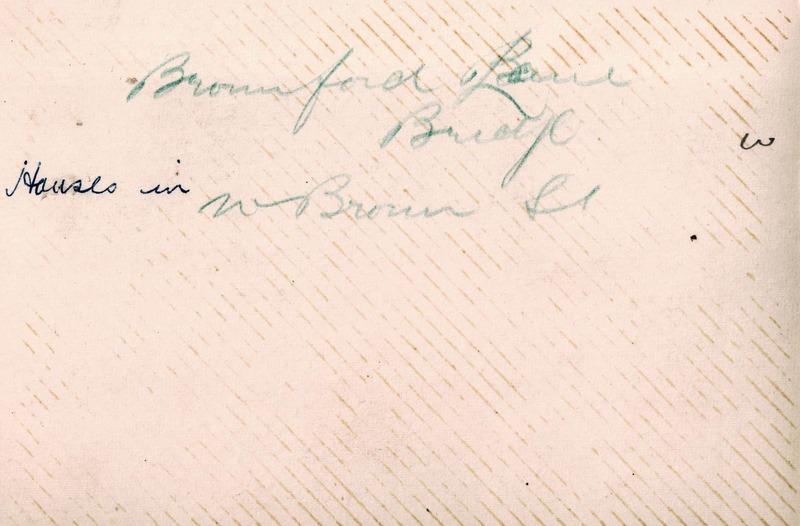 He's written on the back of this one "Bromford Lane Bridge, West Bromwich Street. Houses In West Bromwich Street". And There's a bridge in Bromford Lane. You go to the railway bridge and you go up over a canal bridge and it must be somewhere around there. Presumably these houses have now been knocked down. This was taken by my uncle Len Waters who was my dad's brother. 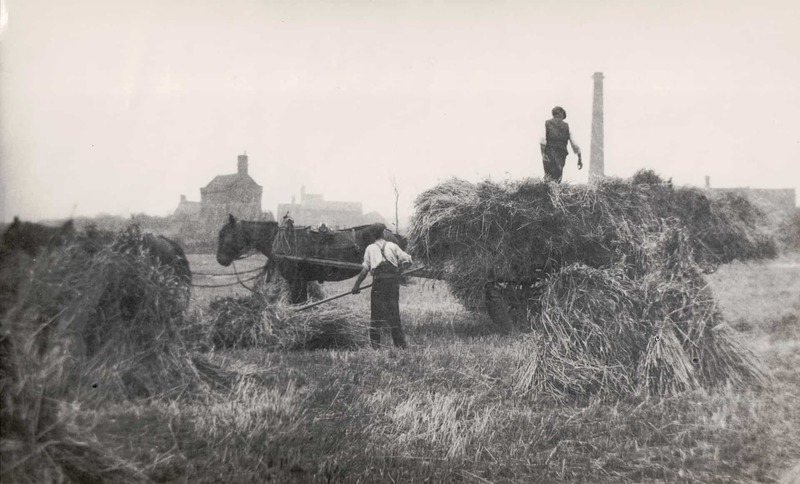 Aunt Mary's put on the back 'Wheat field, Throne Road in the background.' The Waters's came from here, in fact on they lived on Lion Farm before it became the Lion Farm Estate - they actually lived Lion Farm. So It's Whiteheath.